If you’re looking to dim LED light bulbs in your home, shop or restaurant you will need to make sure the bulbs and dimmer switches you use are compatible as not all dimmers are the same. This article explains how mains dimmer switches work and what to look out for to ensure compatibility and performance. 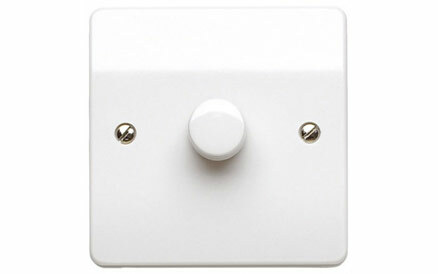 In addition we also stock a range of Varilight dimmers which are recommended for dimming LED. You can browse the range here. Compatibility is not a problem with old incandescent or halogen light bulbs. However as technology has advanced to become more efficient and environmentally friendly, dimming has become more complicated. Compact fluorescent bulbs (also known as CFL or stick shape) should be taken as non-dimmable unless stated on the bulbs packaging. But even then, these dimmable CFLs must be paired with a dimmer that specifically states compatibility with CFLs. All LEDs on our website will say whether they are dimmable or not in the products’ specification. If this is the case then you are using standard mains dimming. There are other types of dimming such as Dali, DMX, and Zigbee but these are more commonly used in larger buildings with more complex lighting needs. For the purposes of this article we’ll stick to the more conventional method of mains dimming. There are two types of mains dimmer; leading edge and trailing edge collectively known as phase cutting dimmers. The national grid supplies AC (alternating current) Electricity to our homes, offices, restaurants, pubs and clubs. 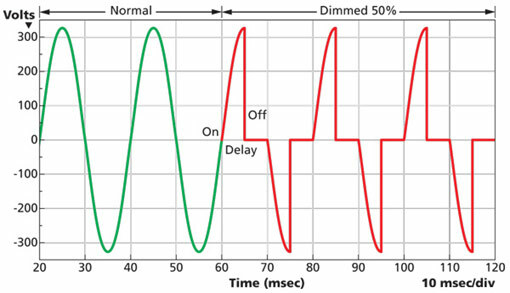 These two types of phase cutting dimmer get their names from the part of the AC wave that they cut off. Leading edge dimming cuts of the front edge of each waves’ half cycle. 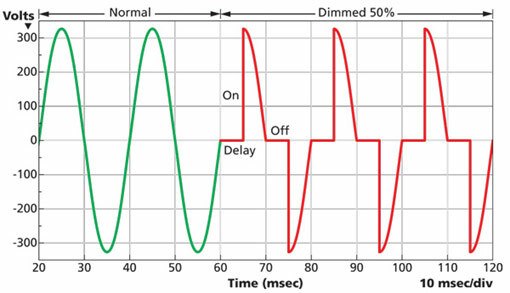 Conversely trailing edge dimming cuts out the second half of each waves’ half cycle. Trailing edge dimmers are now the more popular of the two types. They have several advantages over leading edge dimmers including smoother control, soft start and silent running when in operation. Both types of dimmer can work with dimmable LEDs however due to its advantages, trailing edge is the preferred and as such LED manufacturers have designed their retrofit lamps to work best with this type. Our range of LED dimmers are changeable between trailing edge and leading edge modes but are set to trailing edge mode by default. All reputable manufacturers will be able to offer assistance with dimming of LED’s and all will have a list of compatible dimmers switches that they have tested in conjunction with their LED bulbs. All dimmer switches have an operational range or load that they can work within, a 0-400w dimmer can have 10 x 40 w lamps on it , 8 x 50w lamps on it or any combination that adds up to a maximum of 400w. This operational range will be different for LED’s and will include a minimum loading. A 0-400w Incandescent or Halogen dimmer may have a 10-100w loading when used in conjunction with an LED light source. This means that the total wattage of LED’s on the dimmer must not exceed 100w but just as importantly must have at least 10w of load on it. So, if you had one 6w LED on the dimming circuit the lamp wouldn’t work. Similarly if you had 2 x 6w lamps on the circuit it would work however if one lamp failed or was removed from the circuit the other lamp would extinguish also as there wouldn’t be enough load for it to operate. So to summarise mains dimmers that are LED compatible have two separate min – max ranges; one for LEDs and the other for incandescent or halogen lamps. The key is to always check before you buy. The dimmer manufacturer will provide the min-max levels of load and the lamp manufacturer will provide a list of all the compatible dimmers they have tested their bulbs with. Often this can be found on their websites to download. Not all LED lamps are dimmable – check the packaging/product specification before you buy. Buy dimmable LEDs from well-known brands such as Philips or Osram as they are likely to have been tested and compatible with a wider range of dimmers. There are two types of dimmer switch for mains dimming in your home; leading edge and trailing edge. Trailing edge switches work best with LEDs. If your dimmer switch is old it’s likely a leading edge switch and worth changing to a trailing edge version. Check the min and max loads of the switch are suitable for the number of, and combined wattage of, lamps in the circuit. Research both the lamps and the dimmer switch before buying so that you know you have a combination that works. If you are in doubt about the compatibility of any products or how to make changes to your electrical circuits then we advise using a qualified electrician.